Under scrutiny: Lavasa’s project near Pune. If MoEF fails to pass the order within three weeks, the court will hear Lavasa’s petition anddecide the matter on merit, the high court said. Mumbai: The Bombay high court on Thursday directed the ministry of environment and forests (MoEF) to decide within three weeks on an application by Lavasa Corp. Ltd to the ministry. Lavasa, a subsidiary of Hindustan Construction Co. Ltd (HCC), has applied to the ministry to reconsider its decision to withdraw environmental clearance given to the company’s lake city project. The other pre-conditions set by MoEF include a formal undertaking from HCC giving an assurance that no violations of EPA will take place and hill station rules notified by the government of India will be followed. It would also pledge to create a restoration fund to take care of any environmental damage and commit 5% of the profits for corporate social responsibility activities. A division bench, consisting of justice D.D. Sinha and justice V.K. Tahilramani, pulled up MoEF for passing an “ambiguous" order and said it should have been “decisive and conclusive". “Why doesn’t the order say whether Lavasa’s application has been rejected or accepted? By saying that it is unable to issue clearance, the ministry has kept the issue pending," justice Sinha said. Maharashtra government counsel S.K. Shinde informed the division bench that the state government will initiate action against Lavasa within two weeks. Maharashtra’s environment secretary Valsa Nayar Singh refused to comment on the issue because the matter is subjudice. Additional solicitor general Darius Khambata, appearing for MoEF, told the court that the ministry would reconsider the application filed by Lavasa seeking environmental clearance and pass its final order within three weeks. If MoEF fails to pass the order within three weeks, the court will hear Lavasa’s petition and decide the matter on merit, the high court said. 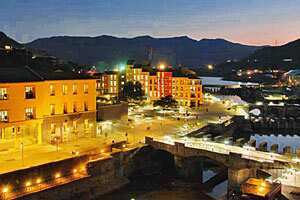 Lavasa lake city is a hill station developed in Pune district’s Mulshi and Maval tehsils in picturesque western ghats. An HCC spokesman declined to comment on the development.